Upgrade your hunting accessory collection with this Spyderco G-10 Black Folding Knife. Designed for the avid hunter or outdoors man, this folding knife features a black laminated handle with skeletonized steel liners tucked within to improve strength. It is ergonomically milled with prolonged fatigue-free cutting in mind and has a stainless steel non-reflective black coated blade. 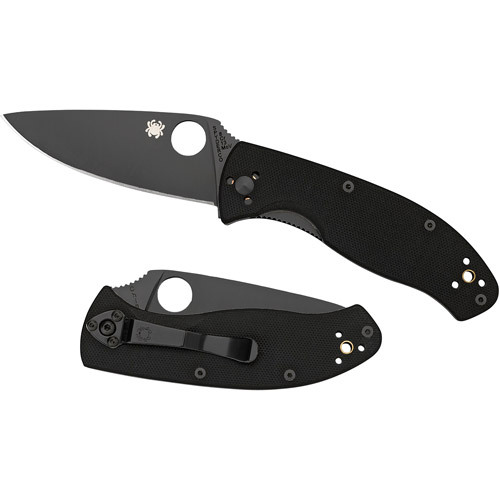 This black blade Spyderco Tenacious Knife includes a black four-way pocket clip for tip up or tip down ambidextrous use with a walker liner lock for safety. Outstanding ergonomics-basically, it feels as if its a part of your hand. Smooth but noisy opening, good but not great steel & multiple options which fit the knife to your personal style. Fantastic entry level Spyderco.